JK | What Does JK Mean? 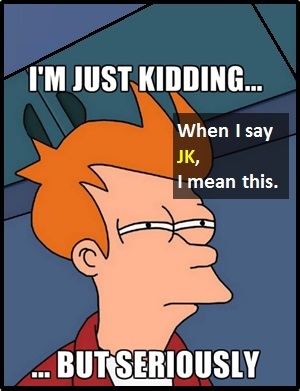 JK (Just Kidding) is typically used at the end of provocative statement to render it void (i.e., by declaring it was just said in jest). If someone uses JK on you, you should bear the following old adage in mind: "Many a true word is said in jest." In other words, the caveat JK does not warrant automatic forgiveness for the "attacker." JK normally means "This is what I really think, but I don't want to have fight about it." "Remember! Many a true word is said in jest." They really messed up your spray tan. Umpa lumpa doompadeedo. JK. You're not invited to the party tomorrow because nobody really likes you JK. The term JK is not used as a part of speech (like a verb, noun, etc.). It is typically used as a standalone declarative sentence, the full meaning of which is "I am just kidding."